In this episode I have the pleasure of speaking with Dr. Alysondra Duke, a Seattle-based Psychologist, Women’s Empowerment Coach, and Founder of Seattle Lady Bosses. She works to empower women to believe in self, step into power, and shake off expectations that no longer fit. We talk about what entrepreneurship entails for women from a spiritual perspective and how self-employment holds a greater opportunity for processing our self-doubt and challenges with relationships, money and worthiness. JM: Hey, how are you today, Alysondra? AD: Hey, I’m doing so great. How are you? JM: I’m really good. You know today, in Phoenix, we have a little bit of some Seattle weather which is where you’re based and I’m jealous that you’re there in Seattle but I think you brought me some of your weather so I’m very happy today. AD: Oh, well, you’re very, very welcome. Actually, we don’t have rain for once today. JM: Oh, you sense it here. AD: So it’s a very clear wonderful day here, yeah, I love it. JM: Nice, you enjoy yours and I’ll enjoy mine. We always want what we don’t have. JM: I am super excited to talk with you because you run this amazing Facebook group for women entrepreneurs which is how I met you and I have been so impressed with what you do so we’ll get into talking about the group in a few minutes, but tell me a little bit more about what you do outside of the group. AD: I am a psychologist in Seattle. My office was actually in Seattle and in Bellingham and my practice is primarily made up of women entrepreneurs which is really just such a wonderful guest and such a wonderful clientele. I have that private practice and then I run Lady Bosses which started actually out of a desire to connect with other people in business as I was starting my own business and thinking, “Okay, how do I make sense of all this and what do I do?” and just connected with what I thought would be maybe five or ten women and now is a community of over two thousand women. I am psychologist and then Lady Bosses Founder and I would say, even in the psychologist arena, I’m on a little bit of the more coaching side of things anyway so that’s just a little bit about what I do. JM: What made you want to get into that line of work? JM: That’s like all the good stuff, it’s like philosophy. AD: But I was really just so passionate about it and got to do such wonderful work in various communities, organizations, and things like that with that degree so I thought, “How can I really make use of this passion that I have for women’s empowerment?” and so I thought, “Why not psychology? Why not be able to help women one-on-one or in groups to grow and to really learn a lot about how to do that really well?” So that’s how I went down the psychologist path. JM: I think it’s so awesome first of all that you knew that very early on that that’s what you wanted to do and you married those two things, psychology and supporting women instead of going the route of women studies. Why women entrepreneurs specifically? Tell me a little bit about the work that you do with them and why specifically entrepreneurs? AD: I think it’s especially exciting to be working with women entrepreneurs because I just love the whole spirit behind it. It’s like women wanting to go out, be in charge of their own lives, have the greatest say over their time, over how they show up in their families, how they balance work and family, I mean I think I just love women having that say over their lives and stepping into what feels most powerful and authentic for them and so I see that so much through entrepreneurship just as an avenue to sort of either claim their life or reclaim their lives in some cases. It’s just been wonderful working with that group because it’s typically a very highly motivated, high-achieving, but also a lot of times, a very highly-sensitive group of people. I just think it’s just like the holy trinity of humanness, all of those wonderful aspects. I just think it’s just the work I love to do because I do think entrepreneurship is not only about the work but it’s an amazing sort of spiritual exercise in life and [inaudible 00:05:26] at every single turn and every self-doubt that you ever had is turned up in just trying to run your own business, generate your own business, get yourself out there, have yourself known. I just think someone who is brave enough to go through that, I just envy and have so much love for that. That’s why I love working with that particular population. JM: I love that. I feel like everything you just said is what I do from the perspective of mentoring and business consulting, I love everything that you just said. It’s so interesting because I think business and entrepreneurship is different for women specifically and when I work with my clients, it’s very interesting to say it’s not for the faint of heart so you’re always like this fascinating human being to me if you chose entrepreneurship and when it’s going well, it really is so empowering, I mean that is always my goal is let me support you in being successful because when you are financially independent, you are not depending on somebody else that holds the purse strings. When you have the ability to support yourself and your family in the kind of lifestyle that you want to have, pay for health insurance, save for college and retirement, and create generational wealth, life changes, it totally changes and not that it’s all about the money but there’s something that has to come before the money comes and it is that confidence and that worthiness that we have to work through. I think especially as women, we’re always kind of fighting the good-girl syndrome, “I have to be nice,” “Should I be charging for this? How much should I be charging for it?” where I think, not all, but a lot of men are pretty solid in how much they’re going to charge and how much they’re going to go out and get and I think we as women really can use that experience as a way to work through some of those issues. On the other end of the spectrum, some of the women that I work with that have the most dysfunctional businesses that are somehow succeeding in spite of them, there are so much of our personal stuff that we bring into our business because I think we tend to look for more emotional connection on our relationships even at work and you know how it is, if you have relationship baggage at home, you’re probably bringing it to work, not always, but probably, so it’s an interesting exercise I think for women to go into business for themselves to have to really work out some of those issues. What are some of the issues you most commonly see when you are working with women entrepreneurs? JM: I love that. It’s such a good point and I think sometimes, I don’t know about you or maybe in the clients that you work with, but I know for myself personally, I think in the beginning it was so difficult, I was almost looking for the signs that I wasn’t cut out for it but no such luck, I’m still here but I think that’s such an incredible point that you make like how often in life do we look at something and think like, “This isn’t for me. I can’t deal with this.” Sometimes, I think there is the rare exemption that somebody really maybe doesn’t have the temperament or really didn’t really want it and kind of fell into entrepreneurship but it’s just like peeling back the layers of the onion and I don’t know, I mean maybe you have some guidance as this goes but I feel like for myself, I don’t know that we ever really totally heal everything from our past but I think entrepreneurship certainly accelerates the processing because it is this very physical manifestation, it’s like very external manifestation of all these layers that you kind of keep going through so it’s always interesting for me to see what comes up for clients when they are building their businesses. AD: Yeah, exactly. A lot of times, that’s what I really encourage women to do is to create a community or find their people so that as they’re going through this, they’re not doing this alone and really taking care of themselves, I think that self-care goes by the wayside but I think it is just such a crucial thing to be prioritizing your own self-care and really showing up for yourself because we are our instruments in this field, we need us to show up and to be well so that’s a lot of what I talk to women about to. JM: Absolutely. Along those lines, that’s an interesting point, we talk a lot about self-care too and I’m curious what kinds of things do you recommend when you are talking to your clients, maybe there is something that comes up frequently in self-care. Are there certain things that you recommend that women entrepreneurs look at? JM: Which can be not good. AD: Yeah, sometimes it’s like we are going to bed at night, we’re taking work in bed and then all of a sudden, all of our clients are really in the bedroom with us and it’s just like, no, that’s not where work should be, so really outlining some of those boundaries and then making sure that you’ve got time to reconnect with other parts of yourself that are not the hustling entrepreneur, so like making sure that you’re taking time to connect with friends or if you’ve got spiritual community or something like that, that all really takes priority so those are some of the main things in addition to the wonderful things. AD: Sometimes, they’re the answer. JM: Right, it’s true and it was like the super rare thing and he is healthy and he is an honor student and he’s kicking our asses right now as a pre-teen so he’s doing just fine. But it’s interesting because at that time, I thought that working myself to death was success. I thought staying up until two o’clock in the morning and working like lunatic was a sign of success when actually I have come to realize over time that when you have the ability to have the schedule more or less that you want to have and you do have time for friends and you do have time for a faith community or a spiritual practice, when you do have time to pursue your passions outside of work, that to me now is true success. In terms of self-care, it’s so funny like you hit the nail on the head, I used to think self-care was like, “I need a facial, my grays are showing and I need to go get my hair done,” and it’s like those things are good but it has taken on such new meaning for me lately, I would say in the last couple of years, and self-care to me now is attending to my emotional state, whatever that is, like whatever form that takes. It’s sitting in my car and taking a minute to have gratitude to feel comfortable in my car and to know that this is a nicer car than I have ever been able to afford and not that it’s about it being luxurious but I had the cars that broke down driving on the street like nothing even happens. AD: Yes, I had one that caught on fire. JM: Oh, so you’ve been there. JM: But really attending to that emotional state, is it that a mug of green tea is going to make me feel good right now? Is it taking five minutes to get myself centered before this phone call? Is it thinking ahead in the future of where I want to be and what I want to be doing and what are the steps I’m taking today toward that? So self-care has changed so much and I really love that you acknowledge and share that it is so much more than I think we typically think of as self-care. It’s a great point. JM: We talk about the challenges of our clients, tell me a little bit about some of the challenges that you have had to deal with in the course of building your own business. AD: I think that I struggle with so much of the things that I’ve seen clients struggle with so I think that there’s just been, throughout my life, a lot of people who have pointed out and I think it came now, I know as an adult, from their own sense of self-doubt and what was possible in the world so I think as I was growing up, I heard a lot about all of the things I can’t do or I wouldn’t be good at or you probably shouldn’t do that or you probably shouldn’t try it. There was a lot of fuel feeding my own self-doubt fire throughout my entire life and so I think that’s been something that I push up against is a lot of that negativity that can come through my own head about whatever [inaudible 00:18:23] of things is that my brain comes up where it’s like, “You are not good enough, you shouldn’t try this, no one’s going to like it,” like a lot of those kinds of fear-based thoughts. JM: You know what I think is funny, I think a lot of people would think that a psychologist wouldn’t have those kinds of concerns. It’s funny because my best friend from high school, she is also a psychologist and she’s like, “Oh, no, it’s the same. It’s the same thing,” and in fact, it’s good because you can relate on that level. What would you tell yourself if you are the psychologist working with a client dealing with that, what is the advice that you would give? JM: That’s a big leap. AD: But somewhere in the middle, even if it is like you can get behind for right now, you know what? I can do something, I can do some things well, whatever the kind of starting point is to like shifting that thought which is often just kind of like what I call a “well-worn groove in the record of self-doubt,” those kinds of things that your brain just kind of goes on repeat around, so that’s the things I tell my clients and the things I tell myself. JM: I love that. It’s such good advice. I suffer from anxiety and a couple of years ago was really bad like it hit a high point for me and I finally had to get to a place, I realized with the help of a great therapist and the doctor and now a nutritionist and a personal trainer like I think that’s my A-team for self-care right there because it’s all interrelated one way or another. But I used to get to that place where I was doing like the opposite of what you say to do like rather than embracing it, the fears were getting bigger and bigger and rationally out of control and finally, it’s funny, I think the way that I finally saved myself before getting the help of my support team, my A-team, it was surrender for me so I guess in a really painful way, I finally embraced it. It could have been so much easier but I had to get to that place where I was just like, “Okay, f*** it,” I mean if things fall apart, they fall apart. You can’t control everything and then with the help that I have received, I really got into the point where the sky is not falling, you don’t have to get to that place where you’re like, “F*** it all,” it doesn’t have to be that bad actually so I love the thought of embracing it. To really kind of looking at those thoughts is actually a really good thing like it’s part of the survival mechanism of trying to keep you safe but it doesn’t mean that you have to act on those impulses, you don’t have to accept them as being true, you don’t have to let them stop you in your track so it’s great advice. How else do you see some of that self-doubt manifest? I mean I imagine probably in things like pricing, like how much to charge, do you see that in clients? Is that something that you have experienced as part of that negativity? JM: Isn’t that interesting how we do that? I think it’s so funny how we underestimate our own abilities and some of the most brilliant women and some of the most successful that I’ve worked with have that little voice of doubt in how valuable their work is and it’s very interesting how we underestimate ourselves. I tell them I always go to, “Let’s look at the proof, let’s look at what history suggests so do you have more great testimonials than you have complaints? If you have more complaints, then yes, we need to talk before you raise your prices, there’s an operational issue, there’s something there.” But I say, “Look at the proof. You have built it to this point, you’re getting great feedback, people who are grateful to you for providing a solution to their pain,” and so I always tell them, “Let’s look at what does the proof indicate? Should you be charging more and is this valuable to your clientele? If it’s not, then we know what we need to start to uncover to get you to that point,” so it’s great advice. Let’s shift gears a little bit. I would love to hear more about Lady Bosses so tell me, it’s Seattle Lady Bosses which makes me so happy because it’s two of my favorite things, it’s Seattle and Lady Bosses, so tell me more about the group and kind of who comes to the group, what is it for. I know Phoenix here is also a big city and there’s loads and loads of groups but you’ve got a really successful one that is not suffering from competition so what makes it different? AD: Yeah, and thanks for asking. I love talking about it because the success of it is really proof of just like whatever you are feeling passionate about, just like put a toe out there, step out there and try because Lady Bosses was just, I just thought I just want to connect with a few other women. I actually started the group on meetup.com and I just thought, “I want to connect.” Honestly, I’m not an extrovert, so doing something like that was a little out of character for me. But I thought I’m actually desperate enough to have community at this point that I will put myself out there [instead 00:27:04] and I had been professionally facilitating groups for over ten years so I didn’t have any worry about that and that’s something that I love doing. But I just kind of put that out there with the desire for connection. From the very beginning, it was about providing women with a really welcoming environment. I had been in so many networking events where I felt awkward and out of place and uncomfortable and everyone’s giving their elevator pitch kind of thing and I just didn’t like any of that so Lady Bosses really started with just a sincere desire to connect but also with what I love to just call the three or four pillars so there’s always candlelight, there’s always wine, it’s always in a beautiful environment, and it’s all about being human first and entrepreneurs second so we really connect as women around, “What are we grateful for? What are the struggles going on? Where can I use more help?” and they break into small groups, we come together in a bigger group, and break up into small groups again with different topics so they’re not just necessarily talking just straight up about business but it is impacting the business. When we have discussions around, “Where do I want to excel in my life or what’s something that makes me feel so excited right now? Or where is something that I’m really struggling with?” that can be anything, personal or professional, and inevitably it leads back to how well you are doing your business or not or getting the support you need. In this community, people end up connecting in this real way and building these friendships and remarkable business relationships that are based on more of a sense of authenticity and not that perform its kind of piece that some of the networking events can have where you’re kind of putting your best self forward and not letting anyone know that you are struggling or dying inside. This is the place where we’re like, “No, this is terrible right now. I hate this,” and it’s a place and space to be able to do that so a lot of women will say, this is just where I come to the community base that I don’t even bring my business cards anymore but that I also get feedback that they’re not having to ask in this way that they do at other networking events, they don’t even have to bring their business cards but that they’ve gotten more business or business connections from Lady Bosses than any of the other groups that they’re paying a ton of money to be a part of or whatever. It’s been really remarkable to just see it grow and it’s been through word of mouth. JM: And running a business. AD: Yeah, it’s various things. JM: And then there’s that too. That’s so amazing. It’s funny because the Catalyst Conversations Dinner Series that I launched last spring, I think in the past, I’ve done this, I’ve seen clients do it, we host these events and we make it about so much stuff, we make it about ourselves and our products and our services and yada yada and what I realized with this dinner series and what I think makes it so successful is that we just make it about the attendees. We just make it about people like super simple, same thing, we do this beautiful dinner and there’s candles and there’s great music and there’s good food and there’s wine and we just have this authentic connection. It’s like you just bring the guard down, we’re all here to support each other, we place a big emphasis on being girls girls like leave the judgment at the door. I think it’s interesting too coming from the social media industry which is my other company because for the longest time, it was like the rah-rah, social media we can connect with anyone in the world in any time and it can be great for business if you are selling $9.99 widgets and it’s an impulse purchase. But as soon as you are in a people business—which I would argue, we’re all in a people business—you have to create some opportunity for authentic connection. I think that we have gone so far down the rabbit hole of social media that like you said earlier, women business owners feel so isolated and we are just dying for that in-person connection with somebody else who has done it, has been there, is doing it, gets it and can support us without that judgment like we are just dying for more of that in our lives. I can say, it is one of the things that I love doing the most because it is so good for my soul too to be in that group of women and it is like faith in humanity restored seeing how bonded these women are, I mean, one dinner, it’s like a group of ten or twelve women walk out of there and I see them friending each other on social media and they go on to do business together. Having that community is just so amazing so I’m excited, hopefully I’ll be able to come out there for one of your events, I can’t wait. AD: Oh, I would love it if you came. It’s just been so incredible because I see these women not only supporting each other in business but they’re supporting each other through pregnancies, divorces, all kinds of life transitions and going on trips together. Every once in awhile I think, “I created this, all these friendships, all of these things, that’s so me,” that has taken often that way. It’s really cool to see women connect in that way. JM: That is really cool. Tell me a little bit about some of the common conversation, so if you were to offer tips to women entrepreneurs, it may be some of the things that you share as the leader of your group, what are some of the top tips that you would share with women entrepreneurs? AD: I think that a lot of the things that we will talk about is, like we’re talking about today, examining self-doubt or examining fear and how to overcome that, addressing those kinds of more negative voices, looking and examining worst case scenario. If you are to take a risk, so what is your worst case scenario? Worst case scenario is you try something, it doesn’t work, you end up not having that thing, you’re basically where you are now in not having that thing. You are surviving the worst case scenario because you don’t have that thing now so taking the risk out there in the world or we talk about things like gratitude, paying attention to what you actually have now, what is working well now even if it feels like, “I’m not where I want to be quite yet or I’m not where I want to be in my business, like what can I see [inaudible 00:34:45] that I have. I’ve always wanted to be in business for myself. I’ve always wanted to create my own schedule and I do and I have that so I just think tuning into some of that even in the face of things not being exactly where you want to be, that’s maybe some of the topics that we will cover or relationship dynamics and how to have healthy relationships personally and professionally, tips for having really difficult conversations and being able to stay grounded in yourself and in that, I mean there are so many things I’m thinking that we do, even down to like breathing, “Let’s all take a breath together,” you have access to your breaths at any time you can be doing this. JM: We are doing coffee in one of the ten million places to get coffee in Seattle. We’ll figure it out right there. I’m sure there will be people who listen that would love to connect with you, how can they reach you? AD: Yeah, they can head to my website alysondraduke.com and that’s where you can learn a little bit more about my work or if you wanted to work one-to-one with me, I do meet with clients from all over the country and do online sessions if they are looking for coaching or even some therapy, some therapy hybrid coaching, whatever it is they can check it out there. If they are in Seattle area, they can check out seattleladybosses.com and that’s where I’m posting all of our events coming up for the year and workshops and things like that so even if people can’t make one of the bigger social events, there’s going to be some different workshops or retreats throughout the year so alysondraduke.com or seattleladybosses.com, both good places. JM: Very cool. We’ll make sure that those are in the show notes as well so if you are listening and you are maybe driving or something, don’t write it down, don’t try to remember it, just head over to the site and you’ll find it all in the show notes. 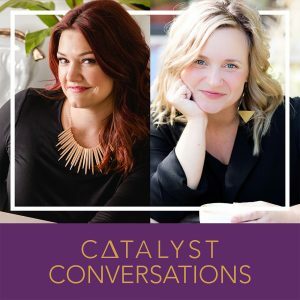 If you’d like to connect with me or check out any of our other amazing interviews with women entrepreneurs, you can visit brandwithcatalyst.com and visit the Blog and Podcast tab. Alysondra, thank you so much for your time today. It was a lot of fun talking with you. AD: Oh, thank you, thank you. This was such a pleasure and I just feel so honored to be on your podcast and with you this morning so thank you. JM: Likewise, thanks for your time.